In my previous post, I discussed the societal benefits of an autonomous vehicle over time. In a current Forbes series, Chunka Mui describes why the Driverless Car Is Worth Trillions, and offers the following additional insight: The World Health Organization estimates that more than 1.2 million people in the world are killed on roads each year, and as many as 50 million others are injured. The WHO also predicts a worsening of road traffic injuries, and sees it becoming the fifth leading cause of worldwide death by 2030. This will account for 3.6% of the total – versus 2.2% in 2004 when it was the ninth leading cause. Given that a large percentage of accidents are due to human error or alcohol use, driverless cars have an opportunity to dramatically reduce the frequency of crashes and save many lives. I recommend this Forbes series for a closer look at the autonomous vehicle phenomenon. Jeremiah Owyang provides additional insight through his recent Post on the topic, and its connection to the Sharing economy disruptive scenario. 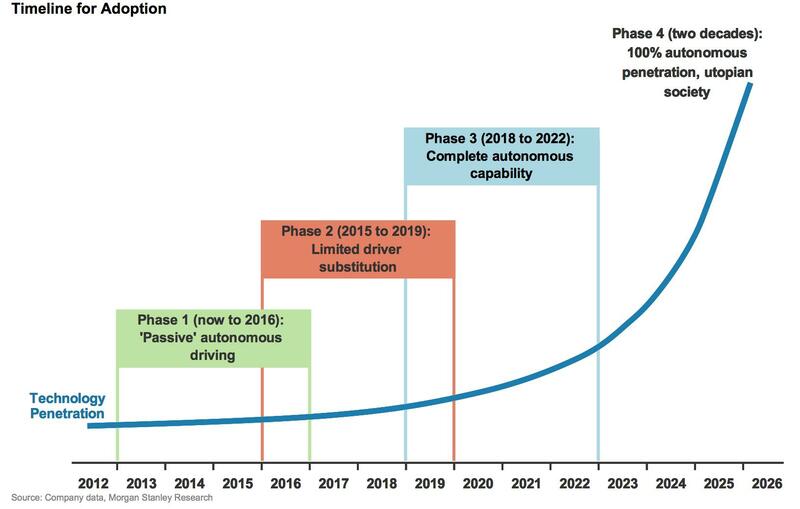 That wraps up this look at possible disruption in the automotive ecosystem. My next post will focus on the potential disruptive scenarios in the Healthcare industry. Although illustrative, the compelling reason for action is not tied to any specific scenario, but the fact that the number of scenarios – driven by several forces – is likely to multiply. As this happens, the probability of disruption grows rapidly, creating a societal impact not seen since the First Industrial Revolution. It is the accelerating potential for disruption that is at issue – not the scenario itself. ← Why Focus on Disruption? We would need 90% less cars than today, so we would only need 25million cars total.